The Atlantic Ocean is heard but not seen. The only light that illuminates the evening comes from two light bulbs dangling between wobbly poles. Beneath a canopy, drummers warm up on large, upright talking drums. A young woman is to be initiated into traditional priesthood in Komenda, a rural fishing village on Ghana’s coast, and we’re waiting for the ceremony to begin. Everyone’s eyes, including my classmates’ and mine, are focused on the row of mostly women sitting opposite us. They’ve removed their shoes. Some of them wear black-and-white beaded necklaces and bracelets. Wofa, my Ghanaian program leader, informs us that they’re akomfo, Akan priestesses and priests. I’m excited about investigating spiritual concepts my African ancestors might have known. A few of my black classmates, also desiring the knowledge, accompanied Wofa and me on interviews with two of Komenda’s eldest okomfo, who invited us to the ceremony. Wofa remarked that the exchange students have never been so passionate about the Fante language lessons and Ghana’s culture. To many of us, it’s obvious why. Thirteen of us are African American. For us, this semester abroad isn’t some exotic adventure. It’s about digging up the roots of our African ancestry. It’s about finding a culture that centuries of our ancestors’ enslavement has diluted or erased. I’m hoping to witness some of that authenticity at the initiation ceremony, but I’m anxious about what will unfold. The akomfo I interviewed vowed that they could heal with herbal medicines, summon rainfall, and invoke an obosom, or deity. When an obosom embodies a priest, he or she can interpret the messages of Onyame, the Akan supreme god. But would the ceremony reveal anything truly traditional? Komenda is in southern Ghana, which is overwhelmingly Christian. My classmates and I were shocked to learn that one of the akomfo-who everyone says knows the most about the old ways-attends church sometimes. I've also noticed that the Ghanaian- and Nigerian-produced pop videos portray indigenous spirituality as evil and dangerous. Characters consult "fetish priests" or "voodoo doctors" who cast spells, complete with beheaded chickens and cheesy special effects. Still, I’m surprised to see so many people at the ceremony. I hesitated to tell my devout Christian host family in Komenda about it, but my host sister urged me to go. She, who disparaged traditional puberty rites, raved about akomfo walking through fire and swallowing dogs’ eyes and whole eggs. “You must tell all your family back home in America,” she said with glowing eyes. An hour after our arrival, nothing much has happened, except for some half-hearted drumming. I’ve put boredom at bay with people-watching. Wofa advised us not to bring cameras, since they’d be viewed as a sign of disrespect, so I make careful observations to jot down later. One of the people who catches my fancy is a Ghanaian boy with a head full of sun-bleached dreadlocks. He sits with other children on the sandy ground. The dreadlocks surprise me, since they seem to have a negative connotation: Ghanaians associate them with Rastas, stereotyped as “wee”-smokers. The boy also has fascinating facial cuttings. Straight lines radiate from the corners of his mouth and eyes. I ask Wofa what his hair and cuts signify. The priestesses’ hairstyles also capture my attention. Most of them wear braided extensions, or have twisted, braided, or looped their hair with black thread. One arrives with her baby secured to her back. She’s wearing pink foam rollers, as though just coming from the beauty shop! My classmates and I look at each other wide-mouthed and can’t help but giggle at this unexpected snippet of Westernization. So much for tradition. One of the few male priests present becomes a spectacle for us as well. Something about him strikes me as odd, and I realize it’s his head wrap. I’ve seen plenty of Ghanaian women wearing head wraps, but no men. Hands on his hips and behind poked out, he chatters in Fante with the priestesses, flapping his hands about for emphasis. He could be the male beautician who works in a women’s hair salon! I’m reminded of a documentary about Vodun spiritual practices in Haiti. When a female deity embodied a priest, he adopted feminine mannerisms and even donned a dress and women’s jewelry as he danced. Just as all of us start to get fidgety from the inactivity, a tall priestess who looks to be in her 70s picks up a metal bowl full of a white powdery substance that has a sweetish smell. Wofa tells us that it’s kaolin. The priestess uses it to draw a large circle in the sand. Near the drummers, she makes a small circle and draws an X through it. Wofa explains that the circle is a strong symbol in traditional African spirituality. Here, it ensures that anyone who enters it will be safe from evil spirits’ interference. The drumming picks up, and the akomfo all march over to my classmates and me. They shake our hands from right to left, as Akan custom dictates, saying “Yaa ahenewa" or "Yaa abrow"-formal greetings based on their clans. After they return to their seats, Wofa tells us to follow him. We cross the circle, shake their hands from right to left, and return to our bench. A priestess grabs a foot-long, palm-fiber broom and begins dancing around the circle with it. Bent forward with her back straight, she waves her arms and twirls the broom as she dances and kicks out her feet. Her feet land so hard that I can feel the ground vibrating as she passes. She taps the broom on the ground in front of the other akomfo and goes to face the drummers, who halt their beating to bow. After a few more akomfo have danced with the broom, my classmates and I exchange glances. With our drooping eyelids, no words are needed. I start to tell Wofa that we’re ready to leave, when a heavyset priestess dances in fast circles as though she weighs 100 pounds. The one in the pink rollers, who sits on the bench across from us, starts bouncing wildly. An elderly priestess jumps from the bench, ringing two bells. She rushes over to the one with the pink rollers, some of which now lay scattered on the ground, and passes her baby to another priestess. She takes the younger woman’s arm and leads her out of the area. My classmates and I whisper to each other, wondering what’s going on. We ask Wofa, and he tells us that we’ve just seen an obosom enter her body. A few minutes later, the young priestess returns without her rollers. Her permed hair has been combed into a bob, but that’s not her biggest change. She’s now wearing a long white cloth tied over her chest. Kaolin is smeared across her exposed upper body and face. Her eyes are half-closed and fluttering. She dances around the circle, emitting a soft, high-pitched sound like “whooh!” Suddenly, she spins in circles and plops herself onto the lap of one of my classmates, who gasps. Wofa chuckles and tells us that this obosom must be in a playful mood. My classmates and I are fully awake now, but it’s midnight, and Wofa advises us to go. We protest. He laughs and informs us that the priestess to be initiated won’t make her appearance during the ceremony until later in the week. On the trek to our homes, which requires the use of flashlights in a village that boasted a prosperous sugar factory, streetlights, and paved roads in the ‘80s, I try to process the evening. I’m debating about the tradition I’ve hoped to find in Ghana, considering that I’ve just seen a “traditional” priestess with permed hair and pink rollers! I ask myself what is more authentic: an indigenous ceremony sprinkled with Western elements, or Africanized Christianity? I’ve witnessed Ghanaians dancing to the tithing box in church and have seen a Ghanaian Catholic priest boogying down the aisle with drummers, among other things! Which spiritual expression should I deem more valid? Could altering some traditions actually be a good thing? 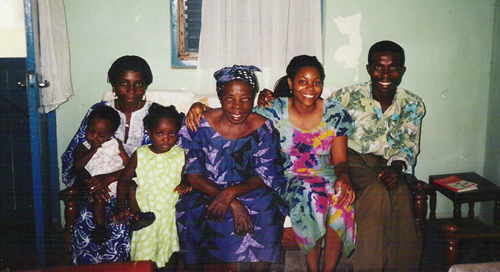 Kim Foote first visited Ghana as a college student in 1999 and returned as a Fulbright Fellow, 2002-03. "A Question of Tradition" is excerpted from a memoir-in-progress about her experiences there. Excerpts have also appeared in Homelands (Seal Press, 2007), MoAD's online Stories Project, and Black Arts Quarterly. She received an MFA in Creative Writing from Chicago State University.